Today is the feast of St Silvanus of Amiens. It's also the 22nd anniversary of the day I became a novice - so it's buon onomastico and a happy anniversary to me! One of the things I most remember about entering the noviciate was something my novice director said to me the evening before: Remember Who you're doing it for. Those words stayed with me, at times almost like a mantra, not just during my noviciate but in the two decades since. Remember Who you're doing it for... and there have been times when remembrance has been sweet and effortless, replete with gratitude and joy... and other times when I have remembered through pain or gritted teeth, or in month after month of praying in dark emptiness. Mostly, though, I have remembered in ordinary daily life; in minor setbacks and challenges and in tiny, heart-skipping moments; in times of reflection and of living our mission; or in times of returning and being recalled, after any forgetfulness. And today, God gently reminded me that any remembering isn't all mine, so that I chuckled as soon as I saw the response to the psalm: The Lord remembers his covenant forever. Yes indeed: I can forget, be fickle, vacillate or have second thoughts, but God, in his great and enduring fidelity and love, remembers and unwaveringly keeps his covenant forever. 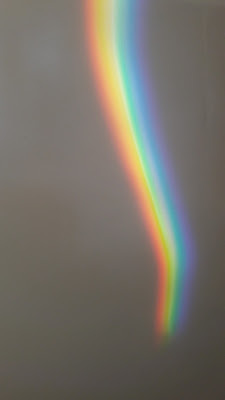 And yes - just to reinforce the message, today's brief sun cast lunchtime rainbows around my room! God's playful, unforgettable symbol of his unforgettable covenant; and something surprisingly sweeter than the Ben's cookie with which I treated myself this afternoon!